Farm fresh eggs are special. On our farm you can see the ducks, geese, and chickens going about their lives. Our chickens, ducks, and geese are from heritage varieties. They are pastured, and do most of their free ranging in our new chicken pasture and the orchard. They range over two or more acres. Frankly, they are too free range, and you may meet them by our house, orchard, and farm store. Our small flock of chickens represents heritage breeds. We have many variedties: Buff Orpington, Delaware, Easter Egger, Cuckoo Marans, Black Copper Marans, Brahma, Araucana, Golden Star, Black Star, Ginger Nut, many other breeds, and barnyard (mixed breed) chickens. The egg yolks are sunshine yellow. 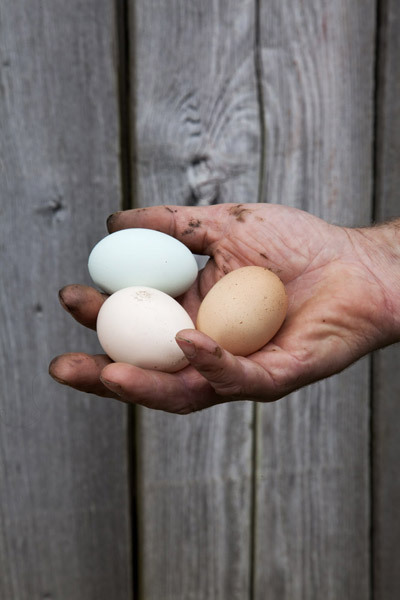 The shells of the eggs come in a variety of colors ranging from blue/green to beige and pink, to dark brown, and speckled. Our ducks are primarily Indian Runner Ducks, who stand very upright and look as though they should be carrying a briefcase. We have a few barnyard ducks, too. Their eggs are porcelain white or blue/green. Duck eggs are larger than chicken eggs, with deep yellow to orange colored yolks. Duck eggs are especially had to find commercially and most people rarely have the opportunity to try them. Our geese are one African gander and two Saddle Back girls.They lay only in the Spring. Their eggs are about four times the size of a chicken egg. They taste most like a chicken egg.